2003 Western Conference First Round Game 4, April 27, 2003 | The Lakers needed big games from their stars after blowing game 3 at home against the Timberwolves, and they got exactly that. Shaq was a monster all game, scoring a series-high 34 points while pulling down 23 rebounds and dishing out 6 assists. Kobe, although struggling from the floor, was able to drop 32 points by getting to the line 17 times and making 16 of them. 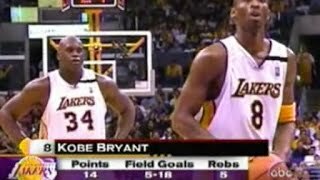 Shaquille O'Neal Full Highlights vs Sacramento Kings 2000 WCR1 GM1 - 46 Pts, 17 Rebs, 5 Blks. 01:50. Dennis RODMAN vs Shaquille O'NEAL Fight!